Dohuk Governorate is a governorate in Iraqi Kurdistan. Its capital is the city of Dohuk. It includes Zakho, the city that meets Ibrahim Khalil border between Turkey and Iraqi Kurdistan. It borders the Al-Hasakah Governorate of Syria.Prior to 1976 it was part of Nineveh Governorate, which was called Mosul Governorate. Dohuk Governorate is mainly inhabited by Kurds and Assyrians, with a small number of Yazidis and Armenians. The estimated population in 2017 was 1,011,585. Al-Darbasiyah is a Syrian town on the Syrian-Turkish border opposite the Turkish town of Senyurt. 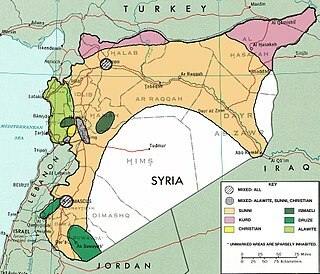 Administratively it is part of the Al-Hasakah Governorate. According to the Syria Central Bureau of Statistics (CBS), al-Darbasiyah had a population of 8,551 in the 2004 census. It is the administrative center of a nahiyah ("subdistrict") consisting of 113 localities with a combined population of 55,614 in 2004. The majority of the inhabitants of the town are Kurds with a large Arab and a smaller Assyrian minority. 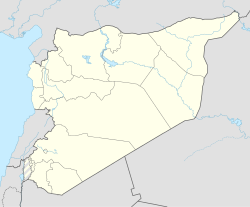 Al-Qahtaniyah, formerly Qubur al-Bid, is a town in northeastern Al-Hasakah Governorate, northeastern Syria. It is the administrative center of Nahiya al-Qahtaniyah, which consists of 103 localities. Historically an Assyrian city, at the 2004 census, it had a population of 16,946. The Gozarto Protection Force (GPF) and Sootoro, united as one organisation, are a regional militia based in Qamishli, Al-Hasakah Governorate, Syria, composed of members of the local an ethnic Assyrian/Syriac and some Armenian communities, founded after the outbreak of the Syrian Civil War that began in 2011. Sootoro claims to be affiliated with the Civil Peace Committee for Syriac Orthodox. The Qamishli Sootoro is aligned with the Ba'athist government of Bashar Assad. Rmelan is a town in the al-Hasakah Governorate in the northeast of Syria. Administratively part of the Ma'badah nahiyah of al-Malikiyah District, the town is located 900 km northeast of the capital Damascus, 165 km northeast of the governorate capital al-Hasakah, 70 km east of Qamishli, 30 km southwest of the district centre al-Malikiyah and 0.5 km southwest of the sub-district centre Ma'badah. It has an area of 5 km² and a population of 11,500, based on the 2009 official estimate.